Feliz Navidad! Merry Christmas! Nothing says `Xmas` more than a festive, flame-red poinsettia plant. Team this with a bottle of red and a bottle of white Australian wine and a decadent box of Chocolatier treats, and you have a fabulous Xmas gift ideal for family, friends, colleagues and staff. 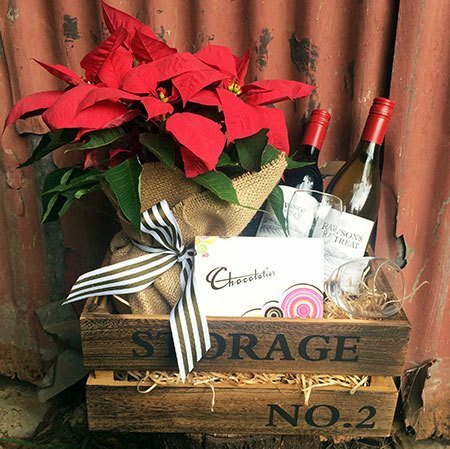 Beautifully presented by our florist team in a rustic, re-usable wooden crate, order these quality Xmas hampers online or call the team on 1800 66 66 46. *Please note: The pictured Christmas hamper and wooden crate is exclusive to Sydney only. Wine glasses not included. For hamper delivery outside Sydney, the team will coordinate your order via an affiliate florist network to recreate our style and content as closely as possible.